This entry was posted in Animals (are people too), musing, Musings, Personal and tagged Bird, Chicken, Connecticut, Home, Leghorn (chicken), Ohio, Sunday, Wikipedia by Alice. Bookmark the permalink. I love to read what you write. I can hear you talking to me as I read. I just think you are a very neat person and I am glad to know you! Why is it that every time you write a story I am reminded of my childhood ? This lovely tale of Henry and Birdbrain brough back memories of our neighbours in Kamptee. They had a dog, a cat, a parrot, a goat, a few hens, a rooster, a white mouse and a rabbit. And there were squirrels all over the place. A proper little zoo their home was. Not at all! I enjoy your comments very much! I get just as much (or more) from these interchanges than I do from writing the blog posts. I’m always a little afraid that some people, maybe even some of the family, regard these things as a touch narcissistic. I’m happy you don’t. I’m a birder big time Alice! Love that you have facilitated their inclusion into your family. Yes, over my whole life I’ve had a number of birds, beginning with the love birds Daddy bought me for Christmas when I was a little kid. Unfortunately that story didn’t end so well. 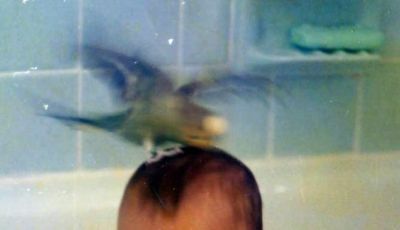 As I think of it, most of my bird pets were allowed to fly free in the house. Once one flew out the house once and I was certain he would be a dead bird before nightfall, or worse yet food for some vulture. But instead it scared him so much to have such total freedom that when I took his cage outside with the door hanging open, he flew right back inside. I think he was actually grateful to be be home. I think there’s a little moral in that, don’t you? We have plenty of sideways flying birds in my neck of the woods, I actually blame the wind for the artwork on the windows. It is the birds that come crashing into the glass that worry me. Perhaps they see the reflection ot the trees and shrubs behind them. No doubt the wind was pretty strong here on the weekend too. We have the same problem with birds crashing into the doors and windows. I keep thinking I’ll put up bird decals in strategic places, but never seem to remember to pick some up when I’m out and about. Luckily we’ve only had about 4 total bird crash instances. Remember the Soweto Owl incident from August 5, 2007? If you missed it and would like to see it once more, just click here. I love these snapshots of your family life no matter how you sneak them in. Give us more, please..
I’m checking it our right now! I’ve been busy re-organizing my library shelves! 🙄 Boy is that a job?! !